Apple's current Mac Pro, which we reviewed back in 2014. We’ve known for awhile that Apple has gone back to the drawing board with the Mac Pro. Apple signalled as much a year ago, while making sure everyone understood that the newly revamped model wouldn’t come that year. In speaking with TechCrunch, Apple straight-out confirmed that the new Mac Pro will be a 2019 product. Apple was keen to clarify the date (an unusual move for the company) because it doesn’t want customers who are currently considering the iMac Pro to hold off, anticipating a Mac Pro launch later in the year. 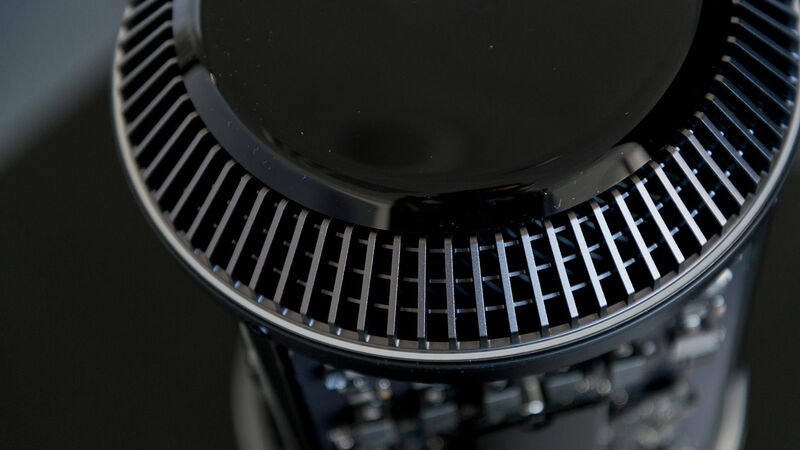 The TechCrunch feature doesn’t give us much in the way of hard information about the Mac Pro revamp, but it’s still a fascinating read. The focus is on Apple’s new product development methodology for pro users. It all starts with the Pro Workflow Team, a new unit within Apple that examines and determines real workflows for real pro users. The focus, at first, is on visual effects, video editing, 3D animation, and music production. The Pro Workflow Team, comprised of real pros in these fields (some full-time, some on contract), find the bottlenecks, pain points, and inefficiencies and then take that information to the engineering teams. Maybe it’s a hardware performance limitation, maybe it’s drivers, maybe it’s software design or a bug...but Apple is using that information to design its new Pro products from the ground up. It’s also good news for Mac Pro users, who have been frustrated by some of Apple’s design choices around ports, keyboards, and the like. Hardware engineering VP John Ternus is quoted as saying, "I want to be clear that the the work that we’re doing as a part of the workflow team is across everything. It’s super relevant for MacBook Pros, it’s super relevant for iMacs and iMac Pros and in the end I think it helps us in dialogue with customers to figure out what are the right systems for you." The impact on you: If you’re itching for a Pro desktop Mac, you might as well grab the iMac Pro (you can read our iMac Pro review here), because the new Mac Pro isn’t landing anytime soon. However, if you’re willing to wait, it sounds like Apple is bending over backwards to make sure that its new desktop is going to satisfy the needs of the kinds of creative professionals who have gravitated toward Mac Pro hardware.